Are you travelling with Finnair? Find out everything you need to know about Finnair baggage allowance, restrictions, fees and charges. When travelling with Finnair, all passengers are allowed to take at least one piece of carry-on baggage. 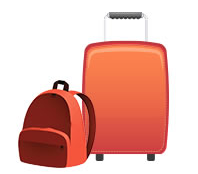 To avoid any delays or unexpected charges, do check that your carry-on baggage is within the size and weight limits. The table below shows how many bags you can bring as Carry-On for the flight, this depends on the fare you have purchased. Maximum Dimensions of Carry-On Luggage Two bags to fit in cabin lockers above seats: 56 cm x 45 cm x 25 cm. One small personal bag to fit underneath the chair in front of you: 40 cm x 30 cm x 15 cm. One bag to fit in cabin lockers above seats: 56 cm x 45 cm x 25 cm. One small personal bag to fit underneath the chair in front of you:40 cm x 30 cm x 15 cm. Most Finnair passengers are allowed one checked bag on the aircraft. However, this does depend on where you’re flying from/to. Each bag can have a maximum weight of 23 kg and external dimensions of up to 158 cm. To ensure your luggage is passed through the check-in quickly and without any hassle, please use Finnairs Baggage Allowance Calculator. If you wish to check-in more bags when travelling with Finnair, there will be excess baggage charges. When flying with Finnair you can add on extra bags to your flight up to three hours before departure, a maximum of three extra bags can be added. Maximum dimensions still apply for extra bags, no piece of checked baggage must exceed the maximum weight allowance of 23 kg. Extra baggage charges differ depending on the route you are taking, please refer to Finnairs website for more information. If your baggage exceeds the Finnairs baggage limits, excess baggage fees will apply. Please refer to the table below for charges that will occur at the airport if your bag is not within the airlines baggage dimensions. The fees below are for one flight only, if you have purchased return flights and your baggage is the same size upon return, you will need to pay this fee twice. Instead of having to worry about collecting your baggage at the carousel and the added stress of registering for your additional bags – use My Baggage instead!